I placed my hand in His, and we began to travel. We ended up on a shoreline, more like a beach; it was dusk. Jesus pointed up towards the sky, and my eyes followed His lead. I beheld the beautiful colors of the sky, as evening time settled in. All of a sudden, I saw a red object coming in from the atmosphere. It got bigger and bigger as it drew closer…it was an asteroid! It was on fire, and looked like a burning, hot coal. I watched in horror as it pounded into the ocean far away. The Lord looked at me and said, “When it hits, they will have thirty minutes, to an hour to evacuate”. After He said this, I saw the water coming in; a tsunami. Last week, the Lord spoke to me and said, “What I’m about to do, no man can take credit for. Over time, I have allowed man, and through Satan using them, to believe they are in control, and have dominion. But now is the time for America to know that I AM. What will be unleashed, even the elite have no idea about, and in the end, even a few of them will fall on their knees and cry out to me”. The second dream that I never posted revealed a tsunami coming to the east coast. This dream was more vivid than the first one I had, which also occurred on the east coast. I saw how high the waves will be. There are two waves, and it will not be as high as some have seen, where half of the country is under water and millions of lives are lost. No, this will not happen because God will not punish the wicked with the just. However, there will be much infrastructure damage; billions of dollars. And many lives will be lost. This will only be the beginning of a domino effect that will collapse the entire country from within. I am posting these things not to frighten, but to forewarn. Too many Christians are asleep at the wheel, and we’re about to drive right off a cliff. We are living in an illusion that “good times” will come back to this country, but this is a lie. America doesn’t deserve better times. We have not repented of our rebellion, arrogance, greed, perversion, murder or witchcraft. The Lord has not given up on America, this is why He is bringing judgment; so that we will repent. 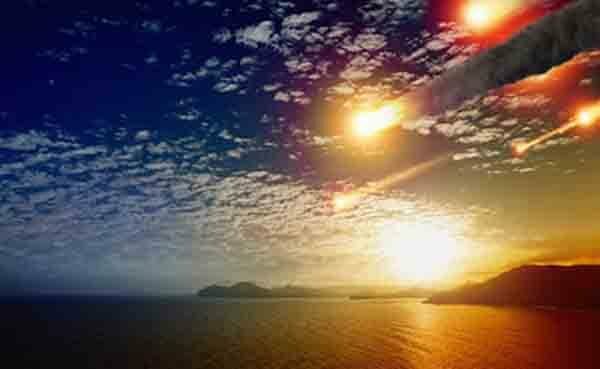 The recent meteor explosion in Australia is a prelude of what is to come, and was totally unexpected. I thank God it exploded at a safe distance. Another warning…. The Lord told me a couple months ago to choose carefully where I sit in church where I can see the door and protect the sanctuary. I am well trained and prepared. Several afghan military students have gone AWOL since labor day weekend from many different bases in different states here in the U.S. on the same day. Just disappeared. It’s online only and definitely weird timing that most of them vacated Labor Day weekend and a few others on the same day around September 16th. Strange indeed. Thank you for posting. My son in law is a youth pastor in Pulaski. Also his family lives in Arab Alabama and attend church there. I do know that my daughter and son-in-law have said that they have trained the church members for a active shooter scenario. I will let them know about this. We appreciate any prayers. Thank-you very much for posting. I have a dear friend near Nashville, TN., and I will forward this message to my friend. You are welcome. My grown children are in Huntsville, and Nashville.. When I was on the phone with my intercessor prayer partner in Huntsville, and sensed the burden to intercede, I did not know about this alert. The Holy Spirit just reminded me of the promise and the covenant He has me stand on while I was living in Huntsville and now Nashville because my daughter and her husband live there…covenant keeping God!…..That the Assyrian will NOT come against that city, nor cast a blank, not even a dog shall wag it’s tongue.. It’s in Isaiah 36…the promise to Hezikiah …….We intereceded until the Holy Spirit gave us peace, and the burden lifted…. 1 can chase a 1,000, 2-10,000,…..I stand with you too and your friend…power in true agreement….. This is probably/hopefully not related. My husband drives through southern Indiana and illinois weekly 64W. He was in the process of driving through both areas yesterday and calls and asks me if something is going on or has happened? I tell him I’m not aware of anything. My husband does not spook easily AT ALL, but he said cops were everywhere along the route with every semi pulled over, made up weighstations checking and stopping everything big. He’s been driving this route for a year and said he has never seen that many cops EVER. He even calls me back about 12-15 minutes later and said he had seen an additional 20 or more cops. This was not in one area, this was spread out for MILES (through illinois) along the route. I have driven this route myself and I’ve only seen 1 or 2 during the entire route myself. He seemed frazzled by it which is what really caught my attention. I’ve been praying for his salvation and safety-open eyes and open ears. I’m not sure what the police were looking for but I pray it’s not terrorism related or anything. n.s. — I’m sure it was terrorist related. The government does not tell the pubic very much; which I think is a good thing. The less the public is told the better. Amen, Bobbi. You really have the right idea of your authority in Jesus Christ. EXCELLENT! Katie,All glory and honor to the Lord……I can’t do anything unless it is from Him…thank you for your kind words….but all praise to God…….We must hear what the Spirit is saying in this hour.The time is late and what is left must be Redeemed wisely……. I agree ,Thank you Bette! I heard your latest video today. Thank you putting it out and being faithful. I do not live in the US at the moment, but my eyes are on it. It is difficult to be out of the country in one way. In one sense I want to be there (strange, isn’t it? When others are being told to leave).All but one of my kids are in the US, and I have tried to prepare them. Anyway, blessings to you, Bette. As long as the Lord is willing……..Wherever you are,we are one in Spirit.. .
Seek the Spirit where you are to be….it is vitally important to hear from the Spirit……. There is also “Translation and Translocation” by faith, if it is under the guidance of the Holy Spirit. This is based on “Philip’s transport” in the Book of Acts. Remember if some of this sounds “new age,” that satan counterfeits the things of God, and he would not counterfeit them if there was not VALUE in them. I just finished a fantastic book/workbook (although I need to actually DO the Workbook) called “Translation by Faith” (Walking in the Supernatural); moving supernaturally for the purposes of God; by Dr. Bruce D. Allen and Michael Van Vlymen. Dr. Bruce Allen was one of the 3 main speakers at the recent Prophetic Conference in Lancaster, California. I don’t think he spoke too much on this particular topic. BUT, you can look up Sid Roth It’s Supernatural TV Archives, and I believe there are 2 WONDERFUL episodes with him. By the way, the “Translation by Faith” book looks to be EXCELLENT on basic training on hearing the voice of God and being aware of the Spiritual Realm. Have read this book and done 2/3 of the exercises. It is excellent! Good for you! It truly looks like a practical tool. I want to get started asap. We need “home-work.” We can’t just sit in church once a week and then do our own thing the rest of the week. We must pursue His Presence DAILY in the secret place. My Pastor says there’s no way around it. If we want to be used by God we need to spend time in the Word and spend time alone with Him. Also, I wanted to say that I found “4 Keys to Hearing God’s Voice” by Mark Virkler an EXCELLENT “tutorial” in learning to hear the Voice of God for ourselves. It’s based on a Scripture that the Lord gave him. I agree with you! I started having encounters and meeting The Lord right after being born again but I would miss so much of it by waiting until the end to write it down. I literally now can write so many pages as I’m having the encounters so I’m able to take down all the details… What I see, what I feel, what it smells like, His reactions, His expressions, His laughter. It is truly a gem and I also recommend it to anyone who’s truly yearns to have that type of intimacy with The Lord. Since I began applying the 4 steps, I hear more much clearer and accurately. Also, it helps having a two-way dialogue with The Lord and having the ability to write it down as it’s happening! Thanks Sonia for recommending it! And Glory God for leading me to it! I truly believe that HE wants that 2- way dialogue. That’s Fellowship. That’s knowing and being known. That’s what Adam and Eve had in the Garden before the fall. That’s what Jesus came to restore back to us. We just need to DO IT!! I hope my testimony can encourage others who may think it’s not possible or may be unaware of it to try it for themselves. The only requirement is to believe…to have faith. Awesome words, Francy. Yes, your testimony is a tremendous encouragement! Oh, I wanted to say that Julie True has about 4 CD’s called “Music to Journal By.” I notice that Mark Virkler used Julie True music as background for his “Sea of Galilee” visualization CD. Journaling with this music in the background must be wonderful. I haven’t tried journaling yet, but hope to asap. I know that when I was writing or editing with Julie’s music (just her regular CD’s) in the background, the writing or editing really flowed. I noticed that without it, things seemed tedious. Julie True is interviewed several times on Sid Roth. The “music to journal by” seem to be just the background for music already composed without the soft vocals…….still could be very effective, though! Wow, Francy, what a testimony!! I am so amazed that you just became born-again in January of 2016 and through this site!! You are living proof that God is accelerating our growth in Him. I will use you as an example to some friends that claim that we need YEARS and YEARS to mature in the Lord. In the days ahead when there is no internet, etc., it will be IMPERATIVE that we can each hear God for ourselves. He will have specific personalized information for each of us. We might as well start practicing this NOW. For anyone that wants additional information, check Mark Virkler’s web-site. There are videos you can watch for free. You can order DVD’s and CD’s as well as the book. The 4 Keys are very simple, but we MUST allow quiet time spent alone with the Lord. No kidding, I’m writing so much because of it daily that my handwriting has improved tremendously! A bonus! Wow, Peggy! Thanks. I will investigate I don’t know if I can get these books here. Each book is very special in its own particular way. OOPS! I’m referring to Faye Aldridge’s books above. I think you were referring to Dr. Bruce Allen— well, his books are available on amazon. “Translation by Faith”—- truly fascinating and inspiring. Amen Peggy ! I have both of their books! I always talked about it and than God led me to their books! It’s time to get ready, for Your Honor and Glory Our King!! I don’t know what is going on, they seem to love the Lord! we have to go by that inner witness, im glad things are comming to the surface i dont want some of the new babys to be deceived! Im sticking with my old time preachers who put The Word above All and tested every spirit..
Hailing from Finland i can see here true fellowship between americans being exhibited! Only Christ can do it and i have to say having had some experience with american believers in Christ that here i can sense the true America still being alive and breathing! Please feel welcome to post your thoughts or join the conversations. You are indeed very intelligent as well as astute about many topics. We definitely welcome our brothers and sisters in Christ from all nations, and that includes FINLAND!! Great to see you here, Stig! OK, I can’t resist sharing this original work by STIG-OVE from Finland. This is a 10- Part Fictional Story based on the American friends that Stig met on Linda Clay’s Blog. “B-2” is Linda (Believeacts2); J.C., her brother; Michael from Arizona; Deb from Montana; Christine from North Carolina; Kenzel from Oklahoma; Vicki from Pennsylvania; Sonshine from Texas/ Colorado; and myself from Pennsylvania/New Jersey. It’s quite a creative work! One of the charming parts is how he has woven the unique personality traits of the various characters into the plot. When Linda took a break from her blog, her brother, J.C., placed this unique work on his blog:. I now present to you: “THE ADVENTUROUS LIFE OF THE BELIEVER” by Stig-Ove of Finland. Definition of terms: “instant weight loss” in Part 8, 5th paragraph from the bottom is “B2’s” (Linda,hostess of Beleiveacts2 Blog) term for decapitation by a guillotine. Truly entertaining,even more so knowing it comes from a Finn! There’s genius in there somewhere…. A bit more punctuation might help. Thanks for sharing! Mena Lee Grebin—, Your visions have also been given to other prophets of God. To me this is a confirmation of your visions. I only listen to a VERY FEW so call prophets. You are one of the very few. I come on this site to read only what you have to say. Please keep us informed of all your visions and dreams. Thank you my sister in Christ. B. Stevens has a new warning out. Thanx Elizabeth just watched, it goes with what Mena saw and the link i posted above as well. Many many Christians have had dreams and visions as to when the Rapture is. And unfortunately they are not all on the same page. Over a year ago I stopped listening to everything and started studing the scriptures for myself and praying my Heavenly Father would show me the truth. I have read Revelations through many times in numerous versions including Tynsdales new testament and theOne New Man Bible. I won’t say what I discovered. Whether pre,mid, or post trib. Because when you get on the subject, Christians tend to get angry if you disagree with them. No where in the word does it say everything is going be be hunky dori dori until the Rapture. God started training me to be a preppy a few years ago. Lots of survival food and water. Tons of toilet paper and much much more. I could live in my apt. a couple of years. But last nite a had a short dream where I started filling different kinds of containers with water, which is odd because I already have a lot of stored water and many water filters. So I believe it was a warning, get ready. Kevin Ball, yes time is short. Only after the spiritual is addressed and settled, should Christians do the extras, i.e. physical prepping, financial pursuits, recreational passions, etc. Allow Holy Spirit to examine your hearts as you rise and as you lie down. I think the “fire ants” of judgments start soon. Be ready, stay ready….watch and pray. Thanks, Mena, faithful prophetess, God bless. Rick Wiles from Trunews just aired a program where he had almost the exact same dream about a fireball and a tsunami coming. He had this dream I believe in 2006. Also others have had the same revelations given to them. Definately a confirmation.